The weather man says today will be stormy! I am usually not a fan of going out in a storm ... I would rather cozy up inside with a warm blanket, some popcorn and a movie. But today I am excited to sport my new Joules wellies! I had seen photos of these cuties but only recently saw them in person. The entire time my friend and I were having lunch I was staring at her feet. 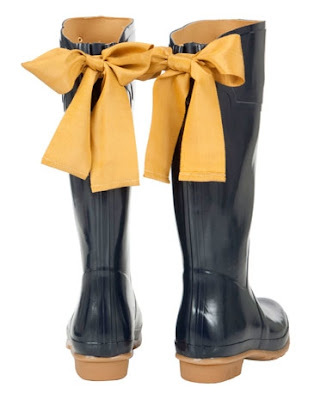 She had replaced the mustard ribbon with pink polka dot ribbon. They were to die for! It was all I could do not to knock her out and steal her boots. If we only wore the same size! At first I was sure I wanted red. 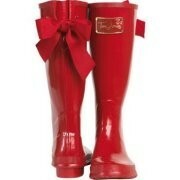 I mean red wellies ... it would be like Dorothy but with wellies. I scoured the website and they were out of my size. It happens when you would probably fit the box better due to having such big feet. Boo!! Then I scored a navy pair on Ebay for half price. Brand new!!! Those babies arrived last week and I have been secretly praying for rain! MHM is bummed her tennis lesson will be postponed due to weather ... but I am busy singing in the rain today with my new boots!!! Way to cute! I LOVE those boots! I am going to look for some now too! Thanks for sharing!